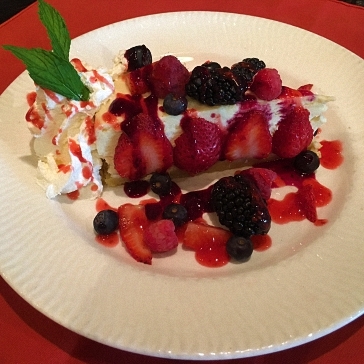 Start with Charlie’s Cheesecake recipe and add your choice of your favorite fresh fruit from the Farmers Market; makes a great summer dessert. Place butter, sugar and flour into food processor and blend. Add egg yolks and gently pulse into mixture. Divide dough in 1/2. Press 1/2 of dough crust into the bottom of a parchment paper-lined round pan. Bake until light brown. Allow to cool and using remaining half of dough, line the sides of the pan and clean the edge for a finished look. Set aside while mixing Base fill. Blend all ingredients and pour into pan with baked bottom and raw-sided crust. Place cheesecake pan into larger pan, filled with approximately 1/2-inch water. Bake in water bath at 350 degrees until done.